A look at the past, present, and future to determine which big pharma is the best dividend stock of them all. Big pharma stocks have historically been among investors' favorite dividend stocks. Which major drugmaker stock is the best of all? I think turning to Charles Dickens can help answer the question. Before you think I've lost my mind, let me explain why I think Dickens can be useful in finding the best big pharma dividend stock. In his classic novel A Christmas Carol, Charles Dickens wrote about the ghosts of Christmas past, Christmas present, and Christmas future to point Ebenezer Scrooge in the right direction. In a similar way, I think we can look at the best big pharma dividend stocks of the past, the present, and likely ones of the future to point investors in the right direction. One big pharma dividend stock looked especially strong over the last couple of decades: GlaxoSmithKline (NYSE:GSK). Since 1990, Glaxo has often boasted the highest dividend yield of any major pharmaceutical stock. Even when Glaxo wasn't ranked No. 1, the stock was usually in the top two based on dividend yields. Bristol-Myers Squibb (NYSE:BMY) stands out as another high-yielding big pharma stock over the past 20 years. Bristol claimed the top spot among big pharma dividend yields for several years beginning in 2002. While Bristol's dividend yield started to slide in 2009, AstraZeneca (NYSE:AZN) began to come on strong. The British drugmaker's yield ranked higher than all other big pharma stocks earlier this decade. It's only fair to note, though, that there was a good reason for Bristol's yield to fall: While dividend payments increased, the stock skyrocketed at an even faster rate. 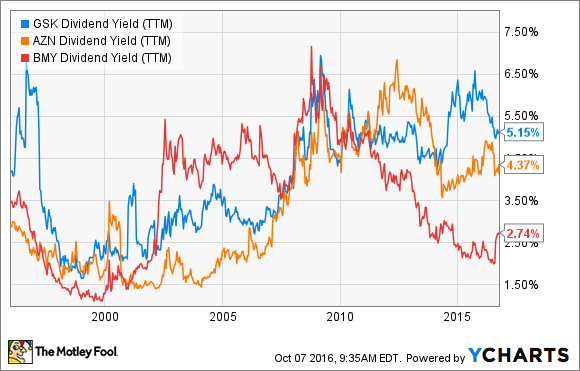 Why have Glaxo, Bristol, and AstraZeneca proven to be dividend yield winners in the past? First, these companies prioritized dividend payments to shareholders. Dividends are in their DNA. Second, the drugmakers sustained the ability to pay dividends. GlaxoSmithKline continues to remain king of the mountain for dividend yield. The drugmaker clearly still highly prioritizes dividend payments. The big question, though, is whether or not Glaxo can keep on paying dividends at current levels. The most important metric for investors to look at to evaluate is the dividend payout ratio, which reflects the amount of dividends paid divided by the company's earnings. A low ratio indicates that a company should be able to continue paying out dividends at current (or even higher) levels, while a very high payout ratio could be a warning sign that dividends might be in jeopardy. Glaxo's dividend payout ratio currently stands at nearly 77%. For every $100 the company earns on the bottom line, it's keeping only $22. The rest is going to shareholders in the form of dividends. Something will have to change. Either Glaxo's earnings need to grow considerably or the dividend might have to be cut. Will GlaxoSmithKline continue to be a dividend star? Maybe. The company appears to be compensating for declining sales of blockbuster respiratory drug Advair, which no longer enjoys patent exclusivity from newer respiratory drugs. Glaxo's vaccines and consumer healthcare business units continue to perform well. However, pharmaceuticals accounts for nearly 60% of Glaxo's total revenue. Despite some success stories, the business segment posted anemic growth of only 1% in the first half of this year. The pipeline includes several solid candidates, but it's going to be several years before Glaxo reaps the benefits from many of these drugs. I think that there's a reasonable chance that Glaxo will ultimately cut its dividend. That won't necessarily make its dividend unattractive, though. But for investors looking for the best big pharma dividend stock, the real potential for dividend cuts isn't comforting. GlaxoSmithKline, Bristol-Myers Squibb, and AstraZeneca have been the top big pharma dividend stocks of the past. 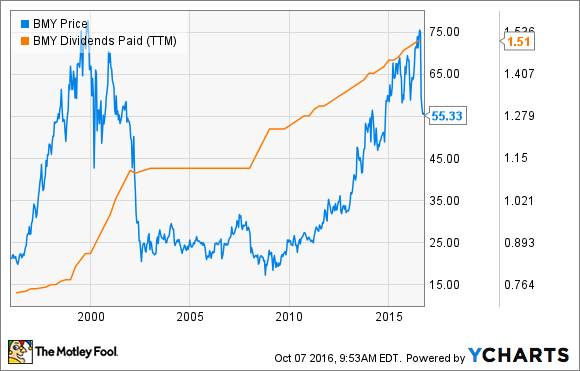 Glaxo has the best dividend yield in the present. But the future looks hazy for Glaxo. That's why my view is that the best approach is to find a major drugmaker that pays a nice dividend now and is likely to increase that dividend significantly over time. A significant plus would be if the company is expected to grow earnings at a solid pace in the future. The one stock that I think best fits the bill is Johnson & Johnson (NYSE:JNJ). Sure, J&J's yield of 2.69% is below Glaxo's. However, the company has increased its dividend payment for 54 years in a row. I'd say J&J prioritizes its dividend pretty highly. Johnson & Johnson has also increased its earnings over 6% annually during the past five years -- a solid, if not spectacular, rate. Wall Street expects the company to do a little better than that in the next five years. Johnson & Johnson has several bright spots in its product lineup that should help make that happen, including Imbruvica and Xarelto. While Glaxo's shares have risen by just over 1% during the past five years, J&J's stock value increased 89%. What's the best big pharma dividend stock? My vote goes to Johnson & Johnson. Not even Scrooge could say, "Bah, humbug," to this stock.